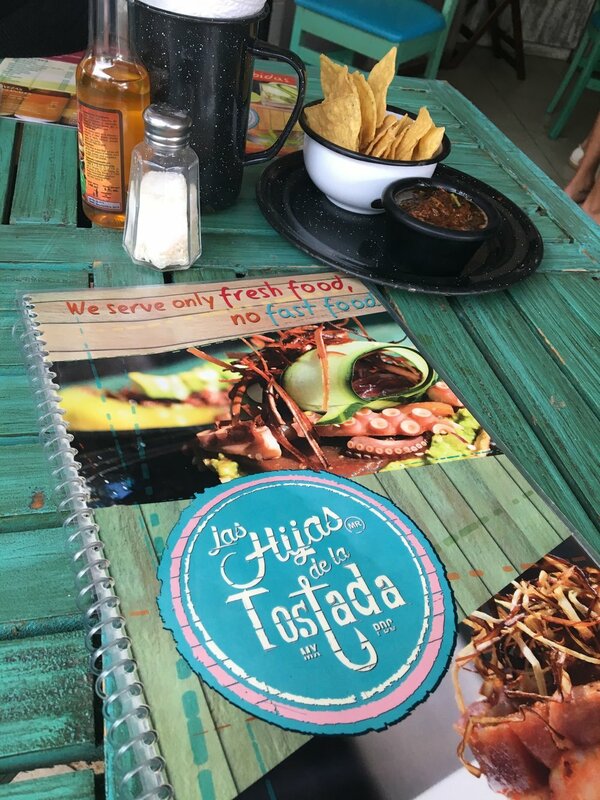 Food Review: Las Hijas de la Tostada — EAT. SLEEP. DISCOVER. We arrived at the ADO station, right in the heart of Playa Del Carmen’s 5th Avenue. We were hungry, it was raining and we had no idea where to eat, despite there being hundreds of options within a 30 minute walk. But with backpacks strapped to our backs and an impending hunger forthcoming, we knew we needed to make the call ASAP. Fortunately, our Airbnb host, Gisele, came through at just the right moment and suggested we try Las Hijas de la Tostada. The menu looked good enough and it was right around the corner from the Airbnb so we took the tip and braved the rain. As we approached, there was no question that we had found a seafood place. The open-air decor proudly boasts a fisherman’s vibe. Faux-distressed wood, brush-stroked a maritimely shade of teal blankets the restaurant. But this isn’t your father’s fish n’ chips joint. They’ve accented the oceanic atmosphere with delicate hipster-bar features like antique incandescent bulbs and the staff follow suit with fashionable outfits, tattoos and hair colours to match the walls. And so of course, we felt right at home. As soon as we sat down, the complimentary nachos and a roasted tomato/cilantro-based salsa hit the table. We ordered two Mexican-brewed beers and fixed our attention on the extensive menu. We couldn’t possibly decide where to begin. 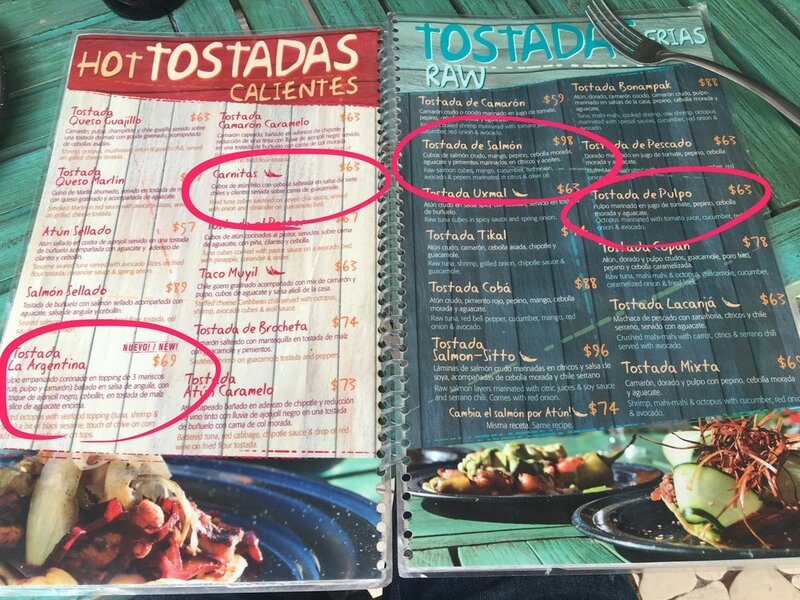 The menu is divided into portions: hot tostadas, raw tostadas, special dishes and veggie options. We focused our efforts on the tostadas since these were clearly the specialty. Our waitress, Paola, was great. We enquired about her favourite tostadas and the three of us seemed to be on exactly the same page. So here’s what we got! From the Hot menu: Carnitas and Tostada La Argentina. From the Raw menu: Tostada de Salmon and Tostada de Pulpo. Tostada de Salmon. This combo of flavours piled high on a crispy tortilla was an unexpected WIN for us. The other ones were delish but they just didn’t hold any weight to this one. The portion size was plenty to share between the two of us. Carnitas. The fried tuna is cooked with a perfect sear and just melts in your mouth! If there weren’t so many other options, I definitely would have gone for seconds on this one. 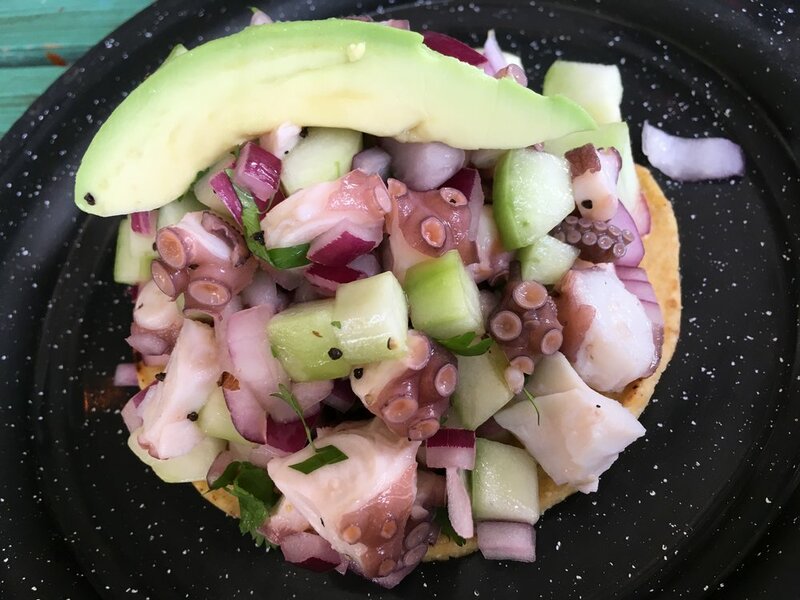 Tostada de Pulpo. Similar to the Salmon version in terms of it’s delicious ceviche nature but less sweet. So very fresh and so very filling! Tostada La Argentina. Unfortunate that this one came to the table last and had some big shoes to fill. It was tasty but didn’t compare to the other three. After having the octopus in raw form, the deep fried version seemed like a bit of a sacrilege. Yeah... it's the one in the back. The Salmon dish stole the fried octopus' spotlight in every way. We went into this meal with pretty low expectations, soaked by the rain and a little worn out with our bags in tow but the funky atmosphere, engaging staff and incredible flavours turned our entire day around. In fact, we loved it so much that we returned a few days later for another pick-me-up after a huge letdown of a lunch at another restaurant around the corner. Once again we were wooed by this charming eatery — but this time with some late afternoon drinks! Ancho Reyna: Tamarind-spiked spicy drink. Linda loved this one. Lipstick Wine: For my sweet tooth, it hit the spot! Mojito: We came across plenty of other versions of this drink throughout Mexico. You can pass on this one. Daquiri: Super sweet and refreshing but nothing particularly special about it. Needless to say, we left with a renewed mood once again. We love this place! If you’re in Playa Del Carmen, Mexico and you’re feeling peckish then you cannot miss this incredible food experience!